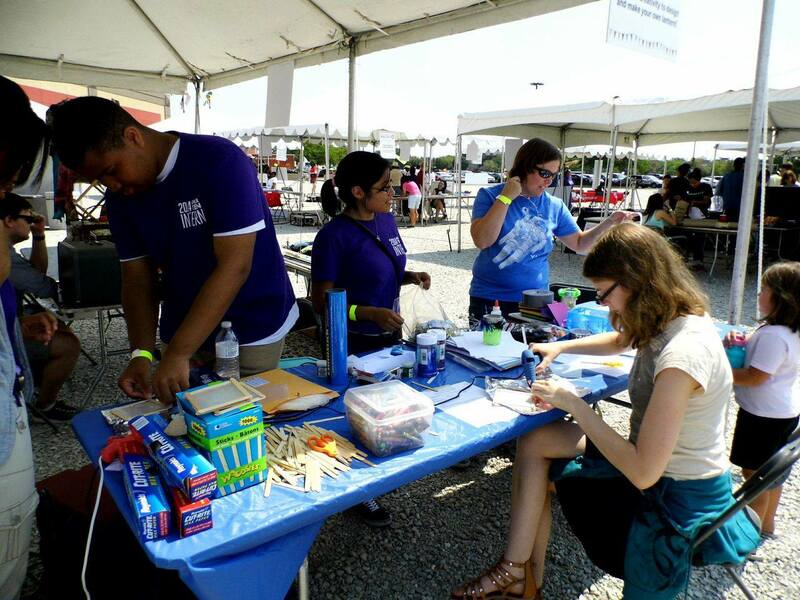 Saturday, August 2, 2014 – as a labor of love – Hive member organizations Agape Werks, Inc. | LevelUP Youth Makerspace and the Chicago Museum of Science & Industry presented the second annual Chicago Southside Mini Maker Faire. We were supported by a large team of volunteers from various organizations. Thank you for your support. Here is our story. This Mini Maker Faire was designed for all ages, but the greatest beneficiaries of this event were our youth. Not only were the exhibited projects things that interested them (e.g. robots, animals, nutrition, web making, electronics, visualizations), but about half the exhibitors were youth exhibiting projects THEY were passionate about. The transition from the role of the learner to the role of the expert is a very effective learning tool for a young person. This is especially powerful when youth realize that they are exhibiting as peers alongside passionate adults. As the youth explained their processes to others, they discovered their strengths and weaknesses in a transformative way that is difficult to recreate in a classroom (or other insulated environment). Some youth from my program at Level Up, who are new to this style of learning, did not prepare for the event seriously. Their lack of exposure made it difficult for them to anticipate the scale of the event. They couldn’t fully connect to the concept of the Maker Faire before they were at the event. It was there that they began to realize how they were solely responsible for content and began to feel a true sense of ownership. Coming to realize that this was not their best effort, seeing the pride others had in their work, they were not so pleased. Yet, rather than feeling defeated and choosing to give up, they voluntarily extended their summer program with me for a few extra days so they could finish and showcase their projects for family and friends the following week. Without the risk of public sharing in a safe space, they probably would have settled for less from themselves and missed the opportunity to experience the joy of overcoming an obstacle. The youth makers were not the only ones impacted by the experience. 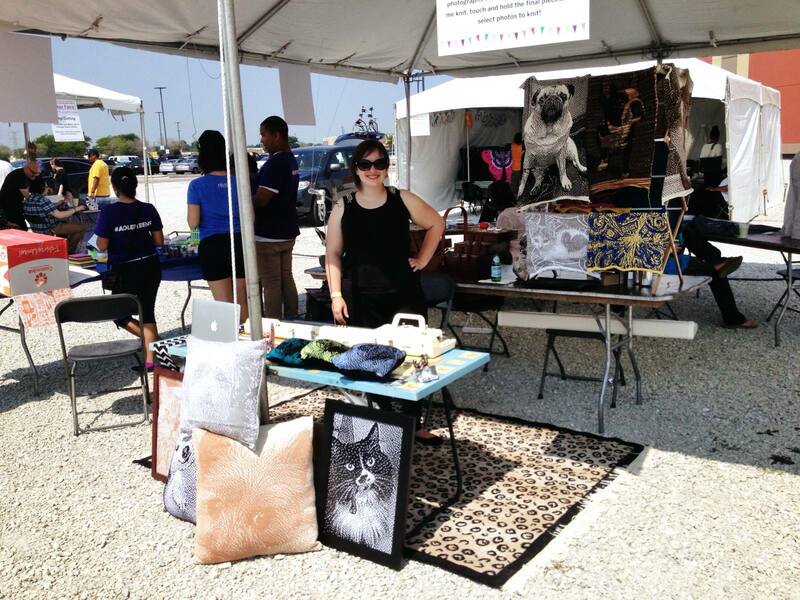 To fully appreciate the value of the Chicago Southside Mini Maker Faire, I believe you need to also see it through the eyes of our adult makers. Meet Makalani Adisa, a world traveler and resident of Chicago’s west side. Adisa is a formal educator who teaches physics, math, and robotics to teens during the day at a south side high school and teaches manufacturing technology and job skills to youth and young adults in the evenings at a west side school in his community. When not working, he voluntarily mentors youth in making and life skills as he pursues his own making interests. Makalani brought his in-progress Hackaday project “Bottles to Brix” (aka Type 1 Civilization Builder) to highlight the societal value of making. Adisa is taking the by-product of social problems on Chicago’s west side and using it to provide a way to rebuild his community. 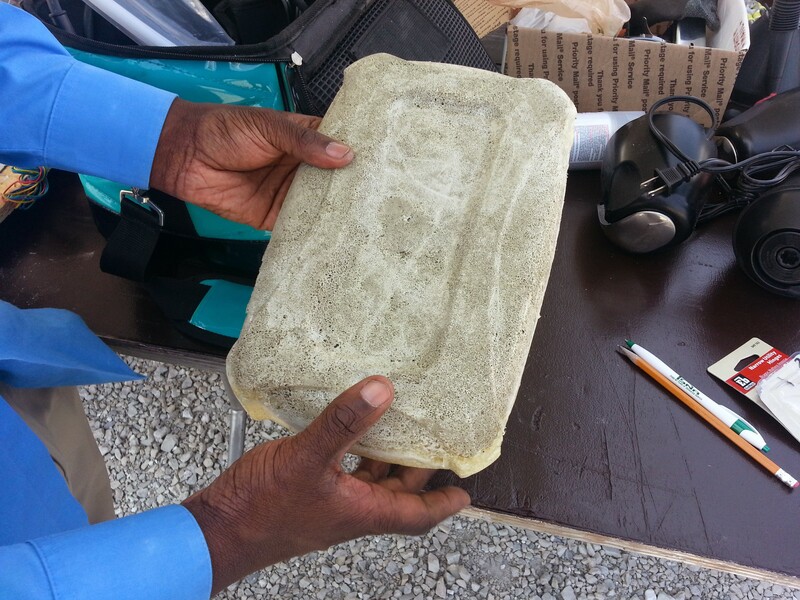 He developed a process to convert public litter consisting mainly of discarded liquor bottles into bricks useful for construction. Initially reluctant to attend Maker Faire because the project was incomplete, Adisa chose to exhibit to provide inspiration for the youth. In turn, he found personal encouragement and support from guests and other makers. As I searched for words to succinctly describe the 2nd Annual Chicago Southside Mini Maker Faire, I recalled her spontaneous exclamation because it captured the essence of this community of like minded “doers” attending a diverse gathering of makers and attendees. It is no surprise that the Hive was well represented. Whether we call them Maker Parties, Pop-ups, Showcases, Jams, Maker Faires, or Festivals, sharing the results of our work is a big part of what we do; especially when what we do doesn’t exactly fit into any neat categories. The fact that so many HIve member organizations brought their learning opportunities to Chicago’s underserved Southside is a testimony to Hive Chicago’s commitment to our priority goals of providing equitable access to all youth. Much like the makers at the faire, we are passionate about our goals and eager to share our successes [and failures] with others. Some organizations are small, and some are quite large, but the spirit is the same. We all want to positively impact the world we live in to make more,do more, and be more than any of us could possible do alone. I know I have found my people! 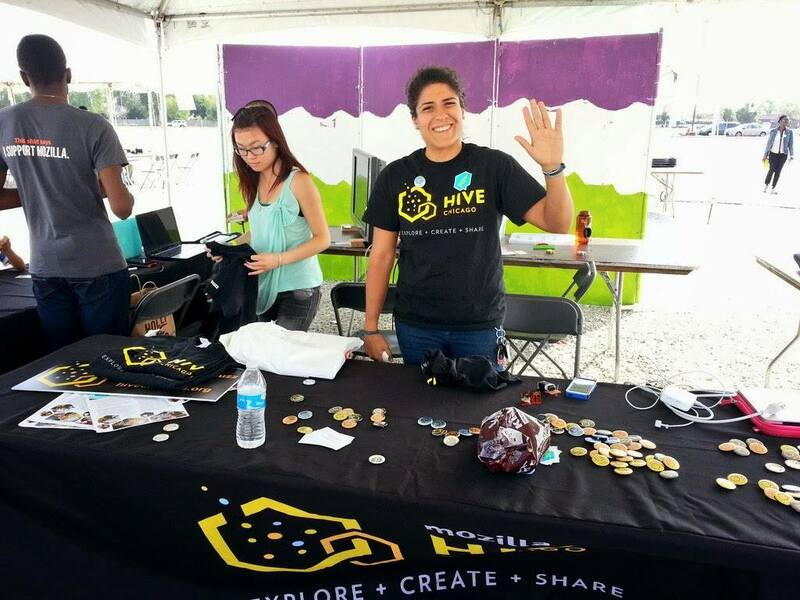 Elsa Rodriguez, Programs Manager, greeting makers and visitors as the Hive Chicago Learning Network representative. A Resounding Success: Thank You! People from as far north as Wisconsin, those who lived within walking distance, folks from as far south as Indiana (and many in between), all came together to explore their natural curiosity about the process of making. 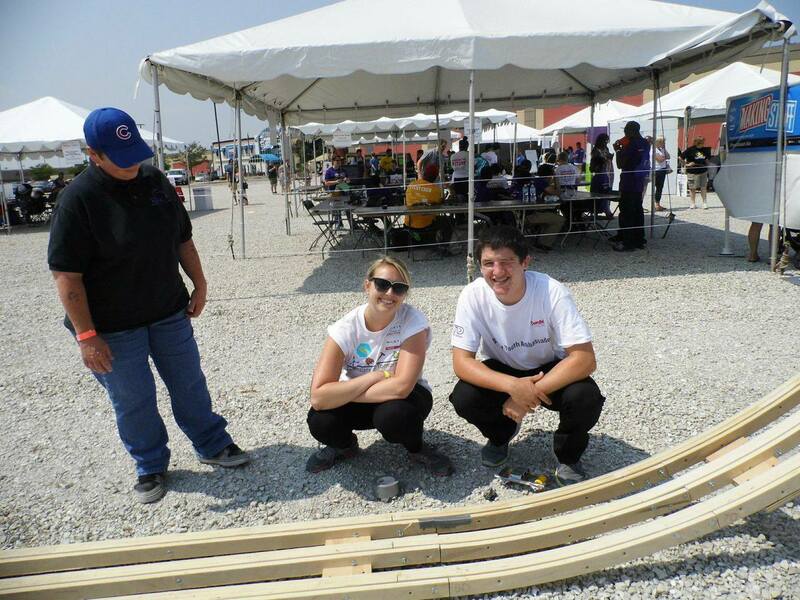 Organizers for the Maker Faire Milwaukee even brought down their Nerdy Derby track for collaboration with LevelUP. Makers and attendees shared ideas about future projects and everyone left with a smile (and often something they made). Over 700 people came to enjoy 34 projects supported by over 100 makers and volunteers. In addition to the projects, a NASA educator presented two hands on workshops to prepare educators to integrate making into their educational offerings. The event was held at Ford City Mall, an indoor mall on Chicago’s southwest side. The mall is also home to LevelUP, a youth makerspace intentionally situated in an unlikely place to find learning opportunities for youth. Hive Chicago members presented youth led projects from Adler Teens (lantern making), After School Matters (balloon powered cars, gadgets, foam rockets), Mikva Challenge (SCCoogle) and LevelUP (learn to solder, Finch Robot Party). There were teens in a booth sharing Webmaker tools and information about Hive Chicago Learning Network, along with youth focused projects from YOUmedia (ornaments from vinyl stickers) and CodeCreate (Cardboard Switching Challenge). For a complete list of makers, visit our maker overview page. Through the generous support of sponsors, including Google Chicago, Hive Chicago, Art of Science Learning, Smart Chicago, and our Indiegogo supporters, we were able to more than double the size of last year’s inaugural Chicago Southside Mini Maker Faire. I can’t wait to see what next year brings! 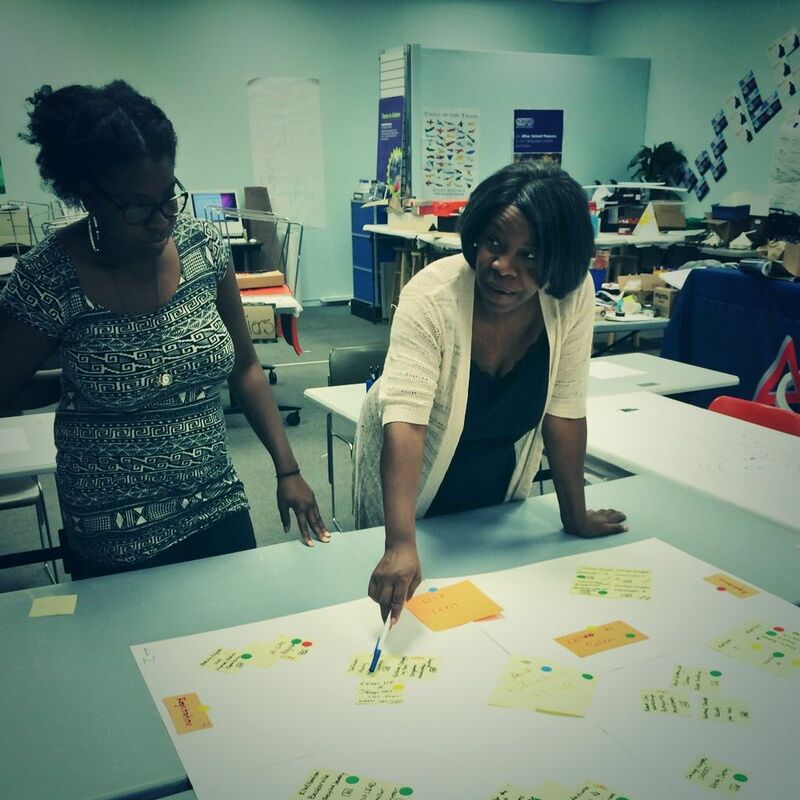 Jackie Moore, Executive Director Agape Werks Inc. | Level Up Youth Makerspace, and her daughter Monica, laying out the Southside Maker Faire grounds in Post-Its during a pre-event planning meeting.